Hatters boss Nathan Jones admitted that the side who he selected against Notts County at the weekend could well take to the field at Fratton Park on Saturday. 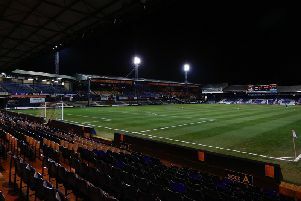 The Luton chief picked a strong team to defeat the Magpies 2-0 and when asked if it would be similar to Portsmouth, he said: “It will be very close. There might be the odd change or two, we’ll see how we go, as we’ve got one more week to go. “There might be the odd change or two, we’ll see how we go, as we’ve got one more week to go. Attacker Elliot Lee, who was at the point of the diamond for the game wasn’t assuming he was a definite starter either, saying: “We’re not taking anything, that’s the team or anything. Goalkeeper Marek Stech appears to have won the battle for the number one jersey over James Shea after getting the nod on Saturday. He lost his place for the promotion run-in last term, as Jones added: “I wouldn’t say he finished second to James Shea, it was like we always said, he had a dip in form and it was an important time. “We felt it was the right time to bring him out because it was the first season, he had played a lot of football and that was a contributory factor. “So we said, we’ve got two first choice keepers, we want them to compete, there’s not a gulf between both keepers so I wouldn’t say he finished second choice. “I would say at the time Sheasy needed to give him some relief if you like and he did. “They’ve both been competing now, there’ll be one or two changes for next week I would imagine.